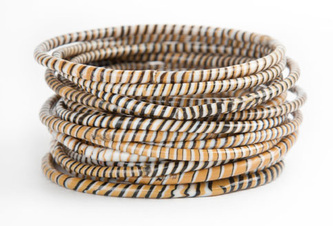 In 2007 Marcasiano created MADE WITH LOVE, a non-profit global initiative dedicated to raising funds and awareness for NGOs aiding women and children in need through the production and sale of products that provide a fair income for women in Brazil, Africa and Haiti. Made With Love works through the Cygnet Foundation, a 501(c)(3) non-for-proﬁt public foundation and supports the following NGOs in Brazil, Africa and Haiti..
MADE WITH LOVE IN AFRICA supports four organizations aiding women and children through the sale of products made by African women - Maison Rose , L'Empire des Enfants , Women of Djenné and the Batonga Foundation. MAISON ROSE (The Pink House) is a home sheltering adolescents, young single mothers and women who have been subject to physical and psychological violence. It is an oasis of hope and peace situated in one of the poorest slums in Dakar, Senegal, West Africa . 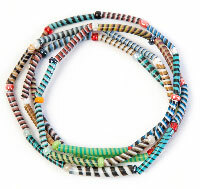 Our new Stretch Bead Wrap Bracelet/Necklace are made by the women of Maison Rose providing them with a source of income. L'EMPIRE DES ENFANTS founded by A.S.A.O, is a center for homeless children from the streets of Dakar, Senegal, providing them with shelter, meals, education and training programs as well as working with local organizations to return the children to their families. 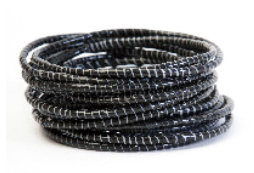 MADE WITH LOVE recycled rubber bracelets are made by women in Djenné, Mali providing them with a viable means of support and are sold to raise funds for L'Empire des Enfants through direct consumer sales, wholesale and strategic marketing. In 2008/09 Made With Love bracelets were sold at Coldplay concerts worldwide. 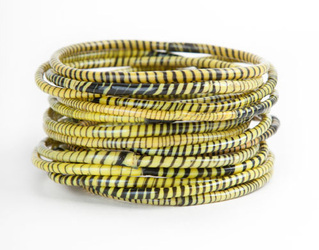 Our recycled rubber bracelets are customized in Batonga's colors of Yellow, Brown and Turquoise accented with a Swarovski crystal butterfly signifying Batonga's symbol of African girls fulfilling their potential. 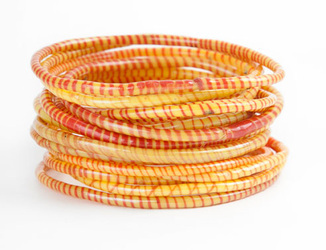 The Batonga bracelets are assembled by the women of Maison Rose providing them with a source of income. 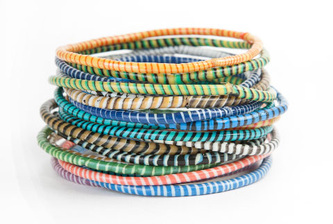 WOMEN OF DJENNE All the products that support L'Empire des Enfants , Maison Rose and Batonga are made from recycled rubber bracelets made by a women’s co-operative in Djenné. Mali. 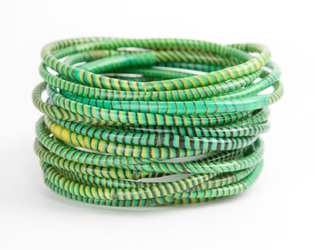 Paid a fair trade price for their work these bracelets provide the women with a viable means of support and and are sold to raise funds for L'Empire des Enfants, a school for homeless children in Dakar, Senegal. 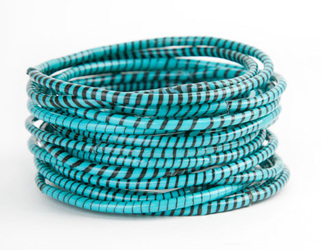 Multi Color, Blue, Green, Yellow, Turquoise, Orange & Brown plus new colors for 2011 Black, Ivory, Lavender and Pink, available for February delivery. ESTRELA NOVA a non-profit organisation working in the favelas of Sao Paulo to improve the living conditions of the residents of the Campo Limpo region. Estrela Nova provides day care and educational programs for the youth in this community. MADE WITH LOVE supports Estrela Nova's Fashion as a Profession program working with their students on design and production and helping create strategic corporate alliances in Brazil and the US. 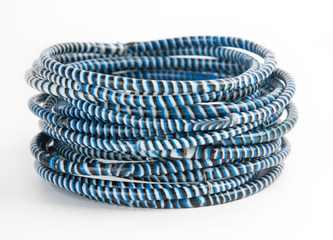 In 2009 MADE WITH LOVE launched the Liberty of London Bracelet, made from fabric donated by Liberty of London and has developed and produced corporate give-away products for Havaianas, Leblon and the NJTL.